The client is a reputed wedding film company based in Ontario, Canada, offering video editing and post-production services online. A cloud-based company, the client handles wedding videos, home videos, event videos, corporate and education footage, independent films and TV productions. The client had a high volume of wedding video footage and wanted an outsourcing partner to create professional wedding videos. The client required a high number of resources on an ad hoc basis, and wanted an outsourcing partner who had the capability to scale up and meet their requirements. On receiving the client's business enquiry, O2I analyzed the clients need and a quality test (trial) was scheduled. During the trial, O2I designated one full-time resource to handle the project. The client transferred fifteen minutes of video footage to O2I, via G-Drive. 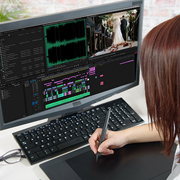 O2I's resource created the wedding video as per requirements using Adobe Premiere Pro and Final Cut Pro X. The final output was transferred back to the client via G-Drive. The trial was successfully completed in four business days. Based on the success of the trial, the client signed an ongoing contract with O2I to outsource 60-100 videos weekly, via a secured File Transfer Protocol (FTP). O2I assigned twenty resources to handle the project. Each full-time resource completes one video in three business days. If the volume increases past sixty videos, O2I assigns two trained standby resources to assist with the project. The client acknowledged the quality of our services, noting that we had far exceeded the quality of their previous design partners. They also mentioned that we had provided a considerable cost savings. Outsource2india offers outsourcing solutions for Creative, Data Management, and more. We have two decades of experience in every industry vertical. Contact us, tell us your requirement and get a free quote within one business day.